In my deepest moments of grief, I find solace in reading stories and poetry about pregnancy loss. There is true beauty when emotion is conveyed through the written word. 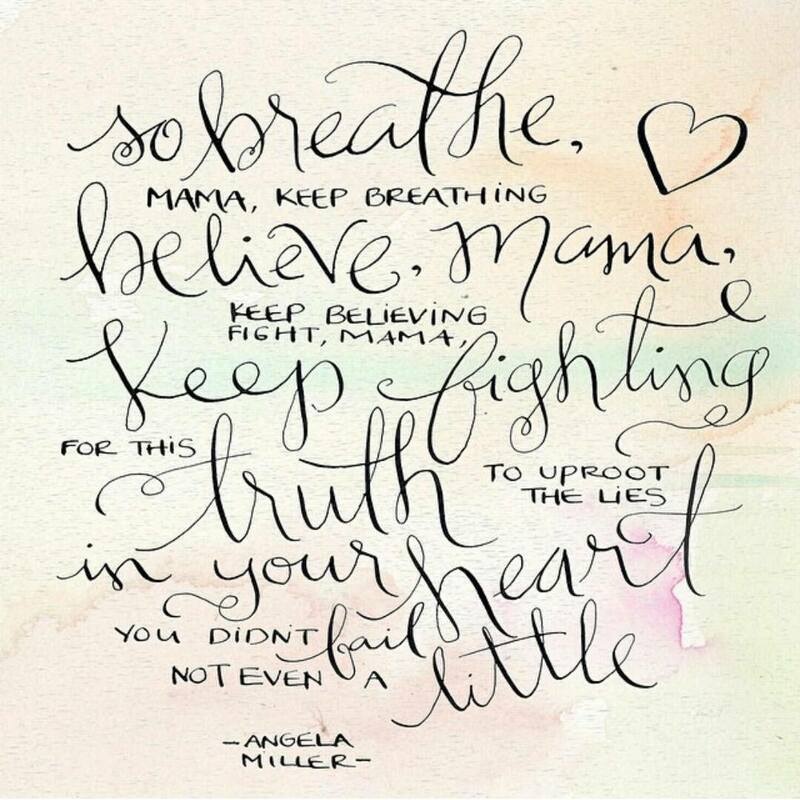 I recently purchased a copy of Angela Miller’s book: You Are the Mother of All Mothers: a message of hope for the grieving heart. When I came across Angela’s site and recognized some of her quotes from Pinterest, I just knew I HAD to have this book. Angela is authentic. Her words reach out and grasp those tiny broken pieces of your heart, gently melding them back together. The book consists of a few heartfelt lines on every other page contrasted by abstract art. If you pick up a copy, I challenge you to see what you can uncover in the brush strokes. I was surprised by what images and messages came through to me as I divulged in the beauty of each page. It’s an easy read, but the experience is anything but easy. Angela keeps it real. Undoubtedly, I can’t deny that it felt like my subconscious was speaking to my ego telling me to put aside the guilt, the resentment, and the feelings of unworthiness. Angela reminds you that it’s normal to feel that way. It’s normal to blame yourself or God. It’s normal to beat yourself up. But honestly, being hard on yourself is the last thing you should be doing. There is no grief like that of a bereaved mother. You ARE the mother of all mothers. Angela’s words are the truth. As you read them, it feels like a slap across the face followed by the gentlest, most loving hug you will ever receive. Her words speak to every single mother who has ever lost a child. We are all warrior mommas through and through. I highly recommend you get yourself a copy. If I had my way, no woman facing an impending pregnancy loss would ever leave the doctor’s office, the hospital, or her bathroom without reading this book. It’s medicine for the broken soul. There was a lady at the support group I went to earlier this week (at my clinic) that went through an 8 week loss. I’m going to see if I can get this to her somehow. Thank you for sharing. Great recommendation; I’m going to treat myself to a copy! 🙂 Such a nice gift for yourself. I hope you enjoy it as much as I did. Think I’ll go look this one up…maybe even get a copy for a friend who lost her baby earlier this year as well. Thanks for sharing!! Thanks for the recommendation hon. I’m going to have to check it out! What a passionate and loving tribute to this deeply compassionate book. Thank you for sharing both. How can I get a copy of this book? I called my local book store and they were unable to locate it for me. Thanks! Check this out, this lady is trying to supply them through dr. offices. Thanks for sharing. I just published a new post to promote this! Hope it does well.